← Diary Notes; 13th. February, 2015. It could become a cliché (see my notes 13th Feb.), but today really did begin yesterday. With an appointment with the TV for the Scotland vs. Wales rugby international, the call from Mark at Roath Park Lake came at a most unwelcome moment. But, as with all such calls, it had to be taken seriously, especially as, only minutes earlier, there had been another call about the same ‘collapsed’ swan, high and dry in the south east corner of the lake. For a swan not to be taking any notice of passing dogs, and then to be picked up by Mark without offering any resistance, something has to be wrong. He was a poor old thing, looking both scruffy and grubby, but of a reasonable weight for this stage in the winter at 8.8 kg. All that could be done at this stage in the proceedings was to get him bedded down at HQ for the night, with the near certainty we would be on our way to the National Swan Sanctuary at Shepperton on Monday morning. Lurking in the background was another call from St. George Park, Bristol to say the only remaining juvenile there was coming under attack from its parents – the usual message at this time of year is; ‘Junior, its time for you to leave before we get really serious, when you really will get hurt’. Trouble was that Junior would escape to the island and therefore would become almost impossible to catch. Maggie agreed to keep the situation under close review, and to grab him if a suitable opportunity arose. Monday dawned relatively mild but wet, and becoming increasingly so, but Shepperton it had to be. If it had been as simple as that, the round trip would have been a mere 284 miles. Just an hour into the journey, the phone rang – good news; Gina and Maggie had managed to catch the St George youngster – he had come ashore instead of retreating to the island. and so now he was safely in care. On the way home therefore, I would need to divert to pick him up with the aim of releasing him into a flock. Shepperton just before midday for a most welcome cup of coffee. The swan must have been mightily relieved to be released into a manger with three other swans; it turned out he was one of those rare swans which was a relatively unhappy traveller. We concluded the most likely cause of his problem had been a territorial dispute. Back on the road, and once again the phone rings to announce another problem on the eastern outskirts of Cardiff; a pair of adult swans had been seen wandering on an arterial road – part of an industrial estate – definitely not the best place to be. One of the pair was seen to fly off, but the other was thought to have disappeared into a reen (drainage channel) – a common feature on what, in this part of the world, is known as ‘the levels’. So; another diversion to see if there was any sign of the second swan. The diversion into Bristol went without a hitch; the St. George swans get fed extremely well; this juvenile weighed 10.2 kg! With the problem in Cardiff, it seemed sensible to take the diversion en route to releasing the Bristol bird. Finding the correct location was easy; we’d been there before a few years ago. Fortunately, there was nothing to be done. There was a lone swan which appeared to have taken up residence on a small pond, and having watched him for a few minutes, it was quite obvious he was fit and well. That said, it was obviously impossible to tell whether or not this was one of the pair which had been seen at lunchtime – some four hours earlier. And so the The Knap at Barry to release young ‘Mr. Bristol’. (I feel certain, judging by his weight, he must have been a male). The release was somewhat untypical. Once the wrap was off, he just sat and looked at 25 – 30 swans which I was now plying with food. Normally, there’s no holding a swan once freed from a wrap. In a while, he stood up, but instead of getting onto the water, he spent the next several minutes preening. 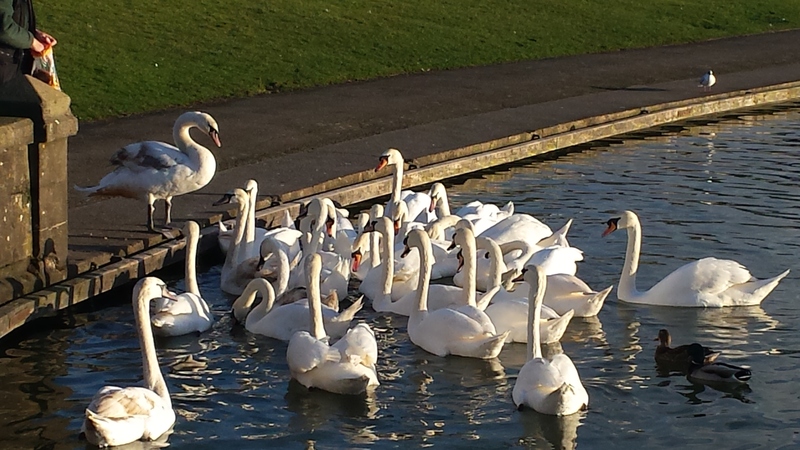 Our swan is the one standing and watching! Eventually, he did decide to move, and in what seemed no time at all, he and another young swan were making overtures (heart shaped display) to one another! And so, back to base, via another desperately needed cup of coffee; and of course its not too difficult to see where the other 57 miles came from – must remember to fill the tank again tomorrow before travelling too far!